Car Care Clinic - Next Clinic Is Set For Saturday, March 30th, 2019 from 9am to Noon - call for reservations at 816-765-6060. Sallas Auto Repair has been hosting FREE Car Care Clinics since 1999. You spend 3 hours with us and in that time we will go over specific benefits of Preventive Maintenance, How to Buy a Pre-owned vehicle, Emergency Procedures and much, much more! During the last hour of the clinic we pull your own vehicle in the shop and go over your vehicle with you - bumper to bumper! This is the most popular part of the clinic. Don’t miss out on this great opportunity to learn more about the machine you rely on for so much! Sallas Auto Repair is more than an auto repair shop. We're committed to educating drivers about how to care for their cars. Our community involvement shows that we're passionate about those who live (and drive) around the Kansas City area. We want to keep Kansas City safe, and especially while driving on city roads and on busy Kansas City highways. That's why we host car care clinics and lunch & learns. We feel that educated drivers are not only safer on the road, but they're also saving money by repairing small auto fixes and avoiding pricey car part replacements. At Sallas Auto Repair, we're also committed to saving our customers money. By encouraging regular and preventive maintenance, we help our customers avoid costly auto repair bills. We perform a 52-point inspection on each vehicle so that drivers know the status of their car while leaving the shop. 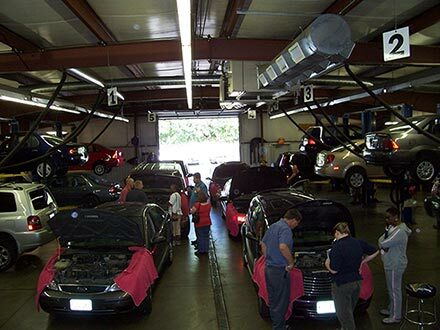 Our car care clinics help teach men, women, and new drivers who haven't had much time under a car hood. We review what to look for and how to "read" your vehicle. Knowing what your car needs for vehicle maintenance and how to diagnose and identify common problems, will save you time, money and stress. Ever wonder what goes on under your car hood? Understand the function of a CV Boot? Do you know what to do in case of an accident, or the best way to buy a used car? Our free Car Care Clinics are designed to answer all of those questions and much more. We feel that all vehicle owners should not only know how to drive, but how to keep their cars running well. We're passionate about vehicle maintenance, and want others to be passionate about it, too! That's why we have car care classes to teach others how to understand and care for their vehicles. Diagnostic time: what is it & what is it for? Why Attend a Car Care Clinic? Upcoming Car Care Clinics - Next Clinic Is Set For March 30th, 2019 from 9am -Noon - call for reservations at 816-765-6060. Clinics are open to everyone; both long-time customers or first time visitors. We ask that you please RSVP, and let us know how many people will be in attendance. We typically host our clinics in April and October, as April is National Car Care Month! By hosting them during these transitional months, we'll be inspecting your car at the best times in the year, preparing them for the upcoming seasonal changes! To RSVP for a car care clinic, email us or call us. Bookmark this page for updates on our next Car Care Clinic. 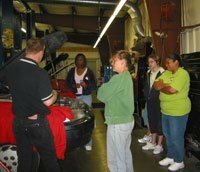 We also give this automobile education class in a shorter, one-hour version at your place of business. These short, one-hour clinics are called Lunch & Learns. To find out more about our clinics or to schedule a Lunch & Learn for your place of business, please call Nick Sallas at 816-765-6060.